In the 12th year of free, AVG is available in a new version: AVG AntiVirus Free 2019. 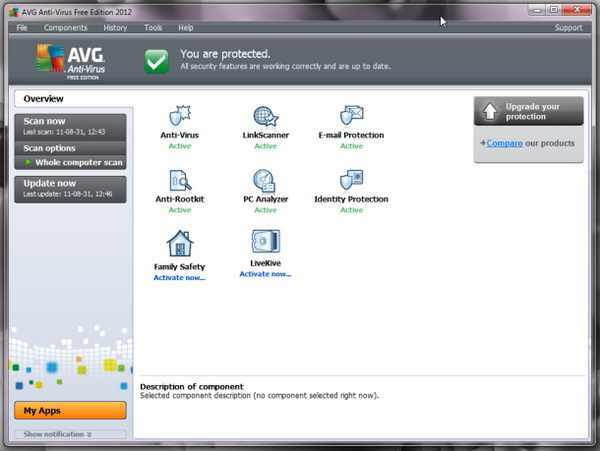 AVG Anti-Virus Free is a perfect software to protect computers against threats to the pesonal data or your privacy. What knows to do AVG AntiVirus Free? Generally provides only minimal protection, but completely free against viruses, worms, trojans, dialer-s and other types of programs affecting your computer, personal data, etc.. Free AVG Antivirus makes automatically update the latest virus definitions about, you provide real-time protection, scheduled scans at various intervals, quarantining infected files, etc.. Note that the license for AVG Free is available only for personal use (home computer) of this software for computer data security. For companies or commercial use you need to buy a license of one between the other two editions of AVG. - AVG Internet Security (provides enhanced protection for anything, even if it's threats to your PC exclusive, internal network or the Internet: searching and browsing the Web, socializing, exchange and sharing files from PCs, email, streaming, including shopping and banking services). - 950 MB (1350 MB recommended) HDD space.